SolidC UltraPure santrifüj pompaların özel özellikleri arasında harici bir conta ve yay, arka plaka üzerinde tanımlanmış bir sıkıştırma O-halkası, aralıksız tasarım ve özel standartlara uygun malzemeler bulunur. 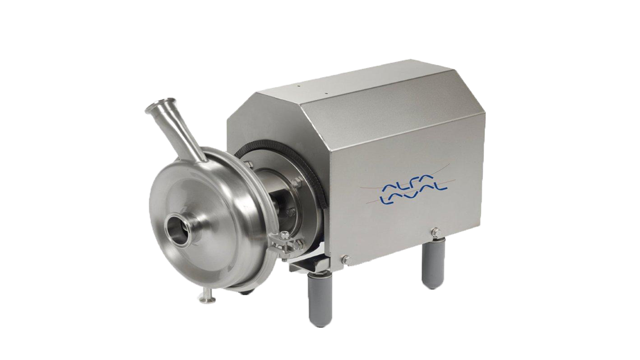 The SolidC UltraPure is a standardized centrifugal pump design that is ideal for use in duties such as Cleaning In Place (CIP) and intermittent product pumping. It is the prime choice for installations where the combination of hygiene and purchase price is the key criterion. SolidC UltraPure centrifugal pumps are designed with features that ensure consistent performance as well as eliminating any risk of contamination. In-depth process knowledge has resulted in a design that avoids any crevices in which contamination might accumulate or bacterial growth can build up. This makes the SolidC quick and easy to clean, saving time, cleaning agents and consumption of high-purity water. Just like the premium LKH UltraPure, the SolidC UltraPure features an external shaft seal and a semi-open impeller with balance holes. Together with a crevice-free design, these are three key features in ensuring end-product quality. SolidC UltraPure units are available in four different sizes. All standard components are kept in stock to shorten lead times and to avoid any unnecessary downtime. All Alfa Laval biopharm components are delivered with Q-doc product documentation based upon GDP (good documentation practice). The Q-doc package comprises equipment manuals, factory acceptance tests/performance test, quality and manufacturing procedures, relevant material certificates and the necessary parts and service information. Alfa Laval provides a 3-year warranty on all non-wearing parts, provided genuine parts are used. The SolidC UltraPure range complies with 3A and CE regulations and has EHEDG certification. Read more about SolidC UltraPure in product documentation. The pump consist of a standard motor, stub shaft, mechanical compression coupling, stainless steel adaptor, back plate, impeller, pump casing and shaft seal. SolidC UltraPure centrifugal pumps feature a unique semi-open impeller with a special vane design that ensures particularly low NPSHr (Net Positive Suction Head required), which is the total pressure at the suction nozzle necessary for the pump to operate properly. This helps prevent cavitation effects, and minimizes any risk of mechanical damage. The impeller also features balancing holes that provide excellent circulation in the shaft seal area as well as reducing axial forces on the impeller. This reduces wear on both the shaft seal and the bearings of the drive motor. cleanability of the shaft seal. The front-loaded external shaft seal, with the spring and washers mounted on the atmospheric side, is an important feature of the SolidC UltraPure design. This configuration makes maintenance rapid, easy and inexpensive – it only takes about 5 minutes to replace the shaft seal. Using a front-loaded shaft seal, combined with the pipe couplings mounted on the pump housing, also means there is no need to disconnect or remove the pump casing for inspection or maintenance. This saves time and money, and helps keep downtime to a bare minimum. This feature also means that a spare pump without casing could also be quickly put into place . Alfa Laval uses the same shaft seal for the whole SolidC UltraPure range – and the same seal is used in LKH UltraPure centrifugal pumps. This standardization keeps inventory down and makes replacing wearing parts a quick and easy task. 1: Defined O-ring groove providing firm positioning of the O-ring on pump casing and metal to metal contact provides a predefined compression of the O-rings with no crevices for contaminants. 2: External shaft seal with few wear parts and spring mounted on the atmospheric side, meaning no wear of the spring or other internal parts going into your product.